According to Ayurveda for maintaining good health and for transforming our, body, mind, and consciousness to a higher level of functioning, a daily routine is essential. A regulated daily routine puts us in harmony with nature’s rhythms, establishes balance in our constitution and helps regularize our biological clock. It aids our digestion, absorption of nutrients from food and its assimilation, it promotes discipline in life, peace, happiness and health. What more could you want? Ha! If you said this to me just a few years ago, I would very quickly respond, that I am absolutely not a morning person, I don’t like getting up early and I always sleep as long as I can. And it was definitely true… until it wasn’t anymore! How did that happen? Well I just decided to get up and start enjoying early mornings. Before I knew it, ok ok it was not that easy in the start, I was happy to rise and shine even before 6 a.m..
Wake up early if you can – before sunrise energies are still fresh and pure as a new day is being born. Nature is waking up and there is a special kind stillness, peace and quite. Try it, I promise it is worth it! Take your time – in nature every process has its time. When you get up pause for a moment and try to feel the energy of the morning, don’t rush, allow your body to follow its natural rhythm. That probably means you will have to get up earier, but it also means that you will get more in tune with yourself and start your day in a calm way. Wash your face with cold water – splash it on a couple of times, rinse your mouth, wash your eyes. For keeping your eyes healthy and strong Ayurveda suggests filling your mouth with cool water and hold it there while splashing cool water over your open eyes 2 or 3 times. This really wakes you up! Scrape your tongue – after washing your teeth scrape your tongue with a stainless steel tongue scraper (you can also use a spoon) – gently from the back of the tongue forward 7-14 times. According to Ayurveda this will remove bacteria, gently stimulate the internal organs, the gastric (digestive) fire and digestive enzymes, helping your body get rid of toxins and waste first thing in the morning. Drink a glass of lukewarm water – it will wash the gastrointestinal tract, flush the kidneys, stimulate peristalsis in the intestines, the descending colon and ileocecal valve and help you have a good bowel movement. Who wouldn’t want that, right! Move your body – listen to yourself and do what feels right for you, whether it is stretching, taking a walk or practicing yoga. Sometimes, when I don’t feel like doing my usual practice or I don’t have time for some reason I do this short morning routine by Tara Stiles – a really nice morning stretching! Don’t forget your mind – it also needs exercise! The more aware we become of our thoughts, the more we are able to control them, replacing negative thought patterns with positive ones and stop worrying. We literally start changing our mind! And if we start the day with a clear and calm mind, we build a good base for the rest of the day. What I find most effective is meditation. And as I see it it can be anything – from sitting down in a cross legged position, sitting on a chair, sitting outside, in nature, walking or something else that suits you. I wouldn’t really advise laying down, because you might fall asleep again. 🙂 For a more effective practice I suggest sitting in a quiet place with your spine straight and eyes closed. Relax, let go of your thoughts and breathe. You can end it with an affirmation to set a specific intention for the day. 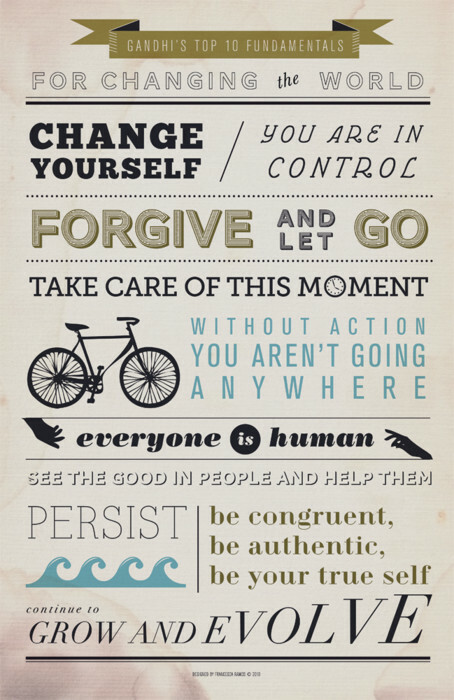 And finally ten thoughts from Gandhi – to keep in mind every day. This entry was posted in Life-hacks, Yoga and tagged Ayurveda, morning routine, Yoga. Bookmark the permalink.